We work hard at Moarly Creative, and we’re passionate about the video production we do. I always say, “The words ‘good enough’ are not in our vocabulary.” We’ll keep grinding until every video is perfect. I’m extremely grateful when our clients recognize that, like Penhall Company recently did. We partnered with Penhall Company to showcase the impressive work they did on the Schuyler F. Heim Bridge demolition project in Long Beach, California. They did more than 30,000 square feet of wire sawing and removed 8,750 tons of concrete from the Cerritos Channel. And, they completed the job over 30 days ahead of schedule. 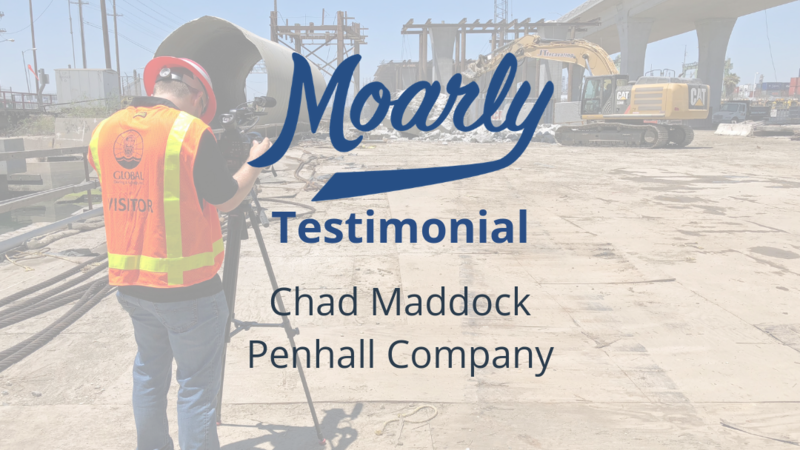 “On behalf of Penhall Company, I would like to thank you and the efforts of Moarly LLC in producing a video that we truly feel highlighted our abilities on what was an extremely challenging project. In order to effectively tell our story, I believe you needed to understand our journey. Your willingness to stand alongside our employees and understand the efforts required of everyone involved was, in my opinion, a significant contributing factor to the success and quality of the video. We can’t thank Chad enough for his kind words. The best part is: Penhall Company was just as great to partner with. We really enjoyed working with them and we look forward to creating more great content together in the future. Whether your video production needs are in Seattle or beyond, we’d love to partner with you on your next project. If you’d like to see more reviews of our work, please check out our testimonials page. You can also contact us anytime or learn more at Moarly.com. You can also connect with us on Twitter, Facebook and Instagram. We can’t wait to hear from you!